Remakes can be tricky propositions. In an interview with Slant Magazine, Spike Lee notes that he met with Park Chan-wook, the director of the 2003 Oldboy, where he was given the following advice: “Don’t do my film. Make your own”. Lee is a director with a distinct personality that can be identified throughout a majority of his output. From the verbal acrobatics of his debut She’s Gotta Have It to the rigid racial commentaries in Do the Right Thing and Jungle Fever to his incredible attention to social milieu in 25th Hour and When the Levees Break, Lee has a penetrating style that’s evocative of his upbringing and teachings. Oldboy may have the superficial flourishes that define Lee’s work, but it’s arguably not a film constructed under his own volition. Rather, Lee is heeding Chan-wook’s request, but approaching the material with a carpenter’s mentality - designing a film with incredible formal proficiency but not signing off on the final product as his own. There is a scene toward the beginning of Spike Lee’s Red Hook Summer that recalls the opening sequence in Robert Altman’s The Player. In that film, Altman employs a tracking shot for several minutes as the audience is immersed in the Hollywood world of its lead character. Lee utilizes the technique in a similar manner, as the two central characters of his film converse with the members of the community. It comes to a screeching halt when Lee himself enters the frame, reprising his pizza delivery man role from his landmark picture, Do the Right Thing. As the audience is introduced to the various members of the community, it becomes increasingly clear that Red Hook Summer would have been a far more interesting film if we followed Lee’s character from the scene forward. Lee delves into the cultural divergence of generations. A boy named Flik (Jules Brown) is left with his grandfather for the summer. His grandfather, Bishop Enoch Rouse (Clarke Peters), runs a local church in a downtrodden section of Brooklyn. While initially playing on the generational and social contrast between the two characters, the film loosely evolves into the role of religiosity in a lower-class neighborhood. Red Hook Summer, more than anything, addresses the subjectivity and overarching importance of spirituality in a community that doesn’t have anything to hold on to. And moreover, it takes some rather bold steps in complicating the relationship one may have with a religion when their vessel is more than they seem. So, in a word, the picture extends its hands to acknowledge a plethora of issues that carry significant weight. This is a far cry from the picture’s opening, which appeared to be nothing more than a sort of fish-out-of-water film. This reaching has been a significant problem for Lee, particularly with his more recent fiction films. One needs to look no further than Bamboozled to see a strong directorial presence overwhelmed by his own material and technique. Unlike his documentaries or 80s output, Lee’s imagery comes across as jagged and less refined. His juxtaposition from scene to scene depends on the deployment of various film stocks, yet rarely does he connect the visual space together. Moreover, his use of music comes across as careless. At first I thought it a bold move to so blatantly transpose lyrical music over Lee’s dialogue, but there was no finesse or flow to its combination – it becomes irksome. Red Hook Summer has particular elements that I responded to. The loose structure and rich social commentary is compounded by a strong lead performance from Clarke Peters. But much of Red Hook Summer’s problems stem from an inability to decide on where to go. This comes from both its narrative composition and technical presentation. Lee’s cameo early in the picture is one that is reverberated throughout Red Hook Summer – he imposes himself on the picture not in subtle strokes, but through broad and jarring movements. 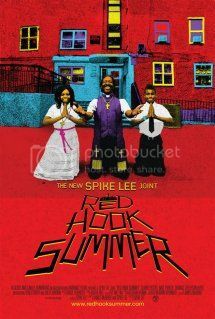 Red Hook Summer drips in stylistic audacity, but for a film that probes social inequalities and spiritual integrity, one needs to question why Lee could not have been a bit more straightforward in his presentation.